Solar Hot Water - the BIG solar reward. self installed with local plumber. Annual inspection of anti-freeze pH and quality. Periodic check of pump, controller and occasional snow removal from collectors after a winter storm. After doing efficiency improvements, envelope sealing energy audit ... Solar Hot Water seemed to make the best 'dollars and cents'. The lifetime of the system is anticipated to be between 30 - 40 years. By harnessing the sun's thermal energy for our hot water demands, we dramatically reduced the need for electricity on an annual basis. Over it's lifetime, even if I replace the glycol every 5 years and a new tank every 10 years, I will still have saved over $30 - $40,000! 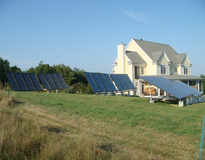 Smartest renewable energy system money spent is solar thermal. 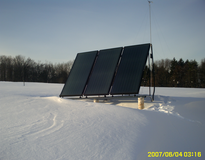 Read Bob Ramlow's book, Solar Water Heating - A Comprehensive Guide before you do anything. 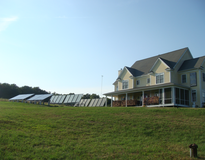 You might even consider taking a solar thermal install class, as this is truly not rocket science to do. I went with a ground mount system as it did not require an elevated angle on my roof, or any roof perforations, etc. As a result of going with a ground mount system, it was necessary to use pressurized glycol fluid. A drainback system could have been problematic with so little vertical gain. I personally prefer flat plate collectors, but evacuated tube systems can work well also. Just be sure to go with a reputable manufacturer. 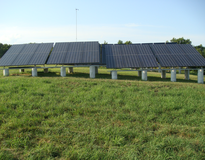 Consider a PV driven pump if you go with a pressurized system if you have unreliable grid/utility power in your area. Otherwise, no power means no pump and with sun. With no fluid movement the glycol can scorch, burn, go acidic and possibly even boil. From Exeter, go south on Route 108 about 1 mile beyond Routes 150/108 junction. From E. Kingston, go north on Route 108 about 2.2 miles from Carmen's Chicken (now called Red Iguana). Yellow colonial house with front porch up on the hill. GBOH Tour for 2013 will on Oct. 5th, from 10am until 4pm.